A couple of weeks ago we`ve made a new video about our S13 kitchen on display. The doors of this kitchen are made of real glass (satined glass in graphite grey). The appliances are from the German brand Neff. We`ve just published a new video about the Teppan Yaki from Neff. The video is embedded on the right. The new Neff FullSteam oven is a very clever machine. It`s not only an amazing oven, but also a real steam oven. So you can make rice in this oven very easy as you can see on this video. The S100 kitchen here on display is recently replaced by a newer version but now with winecooler. This kitchen is now on video too (embedded on the right). In our Snaidero Concept Store we have a big composition of the Ola 20 concept. In our Snaidero concept store we have appliances from the German brand Neff. This time we have made a video about the new Neff coffeemachine we`re selling a lot now. Besides the coffeemachine Neff has a lot of other appliances. We`ll try to make new video`s about those appliances soon. Today we`ve published the video of the S18 kitchen on display in our Snaidero Concept Store. The S18 composition has a wall with tall units in Bianco Artico glossy white lacquer. The island is in stainless steel. 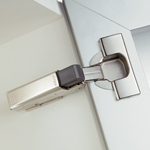 The stainless steel doors are covered with a transparent lacquer to prevent stains. It is possible to make small adjustments to this composition by the way (e.g. replacing the coffeemaker for microwave). Today we`ve published the video of the S100 kitchen on display in our Snaidero Concept Store. 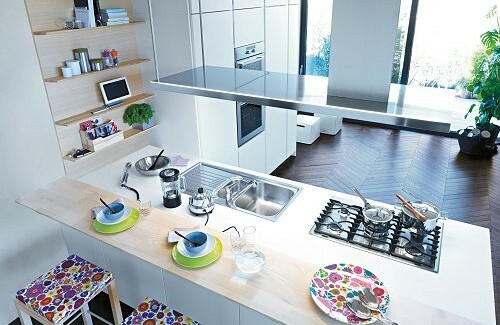 This kitchen is made in glossy lacquered stainless steel. We`ve added the lacquer to prevent stains and to make it easier to clean the kitchen. This high end kitchen is equiped with a lot of appliances. Of course it is possible to adjust this kitchen to your own situation at home. We`ve made a new video of the S20 kitchen on display in our Snaidero Concept Store. This kitchen island is made from inox (stainless steel) an can be extended with units in (glossy) lacquer or even wood. 20/12/2014 Merry Christmas and a happy new year! Hereby we wish all of our clients and relations a Merry Christmas and a happy new year! 19/12/2014 New Ola 20 kitchen on display!! We`ve recently added a new Snaidero Ola 20 kitchen on display in our showroom. Watch here the video of this kitchen. As our showroom is in the Netherlands the video is dutch spoken. We`ve recently have installed a new S100 kitchen for a client here in the Netherlands. Watch here the video of this kitchen. Watch here the video of our Mussels party here in the showroom. Watch here the video of our Italian evening in our Snaidero Concept Store kitchen showroom. Our showroom is scheduled to close for its annual Summer Holiday starting at July the 26th through August the 18th. Also our instsallers are not working in this period. Today we`ve made a Snaidero video of kitchens made in Italy. Since we are located in the Netherlands we have a Dutch written blog for a couple of years now. For our clients living abroad we`ve added the Google Autotranslate knob (located on rh side of the screen). Click here for our blog about Italian design kitchens. Today we`ve made a video of the S18 kitchen composition in our showroom which has been embedded on the right. The video is Dutch spoken but gives a good impression of this kitchen. Recently we`ve made a video of the S10 kitchen composition in our showroom which has been embedded on the right. 05/03/2014 Video of the kitchen behind doors "pantry"
With a sleek Italian designed kitchen most clients prefer to keep their island clean and tidy. For those clients we have the "pantry" solution. A small kitchen behind folding doors. Also this video is Dutch spoken but gives a good impression of the unit with folding doors (width is 120cm). Recently we`ve made a video about how to make Mussels in the Míele high pressure steamer (embedded on the right). The video is Dutch spoken but you can clearly see it is very simple to make good food with the Míele high pressure steam oven. This weekend we have had our 10th anniversary with our Snaidero Concept Store. From Edi Snaidero himself we have got a nice award and a lot of good San Daniele Prosciutto. Click here for the images (sorry for Dutch text). We are proud to present a successful example of a contract project just finished by our retailer Rudy Jacobse Snaidero Concept Store in Arnemuiden (the Netherlands). This project, called "de Dokke", consist of the construction of a new supermarket (Emté) and 19 appartments above it. Among these appartments, 11 where for sale and the others for rent. The Snaidero Concept Store Rudy Jacobse has been chosen to deliver the kitchens, and the standard kitchen was fixed as the Sistema Zeta for the owned apartments. Due to the client wishes, two of these kitchens where changed, one for Terra and the other one for Idea. The other kitchens where in Sistema Zeta, the kitchen where innovation becomes architecture thanks to compositions with a strong identity. Practical details make up a fresh and contemporary style, and leave room for unique shades of colour that live together harmoniously. Enhancing the two-tone colour to highlight the various work zones. Sistema Zeta is a model with no fancy trim, which rediscovers the authenticity of the forms and ornaments but rich in content. As already said, there was also the possibility to change the kitchen model within the project, and some clients did like to do. One owner chose the model Terra, the kitchen that uses naturalness and warmth to create its own essential features. Terra means merging elements, getting rid of the inessentials and simplifying the essentials. The new door shape is the most characteristics feature of Terra: the handle is built into the wood, and the attentive use of light and shade allows you to fully appreciate its double depth. Every ingredient that sets this kitchen apart has been designed to enhance details: like a soft pencil, the worktop highlights the surfaces and equipped back panels and brings out the quality of the craftsmanship. In Terra, the design of new functions and components is perfectly in line with the aesthetic fundamentals of the project. Starting from the masterful use of light, which is more pronounced and focuses on details such as the hood, shelving and back-lights. Another owner choose to change the standard Sistema Zeta with Idea. Idea's design is intended to bring together shapes, technology, style and functionality. Pininfarina has restyled this traditional Snaidero model, without handles, maintaining its great appeal, while adding its unmistakable style. The aim is to rediscover a design for day-to-day living, thanks to selected contemporary yet all-embracing shapes, adding elegance with simple and exclusive elements. The design features of this kitchen are its refined details, with its lines carving out unique shapes. Elegance is to be found in skillfully selected colours and materials, without extravagance, as shapes are entirely simple, sophisticated and unobtrusive. Designed in 1968 by architect Virgilio Forchiassin, the Spazio Vivo kitchen was on display at the MoMA in New York for its innovative stylistic solutions. Forty years on, the innovational content of this kitchen is still acknowledged, and reintroduced at the MoMA in an exhibition called "Counter Space: Design and the Modern Kitchen." Open until 14th March 2011, the exhibition explores the 20th century transformation of the kitchen, regarded as a barometer of the social and technological changes of the 20th century, when the kitchen became a highly symbolic and practical place. It all started at the beginning of the century, when the kitchen was considered a functional place, rather like a "factory" or a "laboratory". This continued in the '50s, when the consumer centre of gravity shifted towards the "pleasures" of the kitchen, as illustrated by the brightly coloured Tupperware of the '50s and the "Still life" collage, of 1963, by Tom Wesselmann. The reality of the kitchen, however, is not only what is created by designers, since the people who live in it alternately charge it with neurosis, frustrations, pleasures and social relations. The exhibition in New York also shows this with photographs, prints, multimedia works and sculpture installations, which highlight how the kitchen has also permeated artistic practice due to its symbolic value, which, from the end of the 1960s, kindled debate about the economy and politics. To illustrate this period, in addition to a Frankfurt kitchen of 1968, the Spazio Vivo kitchen by Snaidero was chosen to symbolize Italian kitchens, which represented the forbidden dream of many women in Italy during the boom period. Taking part in this exhibition, once again, Snaidero expresses the great tradition of the brand on an international scale. During over 65 years of experience, innovation and design have been the distinguishing features of unique and immediately recognizable products. Read here the Italian news paper article in pdf. 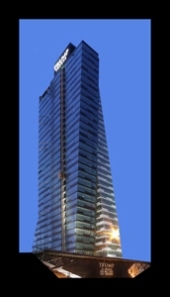 24/09/2010 Snaidero furnishes the Trump Tower in Istanbul with more than 200 kitchens. The Trump Group has chosen Snaidero, one of Europe's leaders in the manufacturing and distribution of modular kitchens, to supply the kitchens to be installed in the two luxurious Towers being completed in Istanbul, designed by the Brigitte Weber architectural studio. After the two important commissions secured during 2009 for the supply of more than 500 kitchens in residential areas, the Majano Group further consolidates its presence in Turkey, thanks also to the fruitful collaboration with its historical Turkish partner, Eng. Bulent Durlanik who represents the important Cankutaran Company. This achievement confirms the trademark's strength, proposing an exquisitely designed product, completely Made in Italy, backed up by the high standard of components and materials, but also by the capacity of the company that, within extremely short times, is able to manufacture a great number of kitchens customised to specific client requirements. For this work order, Snaidero will supply the innovative Snaidero Orange product, which met with the approval of the architects because of the particularities featured in a designer and quality kitchen, which at the same time is also simple and competitively priced. Orange is a design that perfectly represents Snaidero's ongoing commitment to environmental protection and to the company's social responsibility. In fact, Orange was conceived to be "green": an eco-friendly kitchen designed according to eco-sustainability criteria to improve the quality of home-living. Orange uses ecological wood, varnishing treatments relying on water-based products but, above all, it adopts a new panel with an extremely low formaldehyde emission. Snaidero reacts to the difficult challenge of the International economic crisis by continuing to invest and to consolidate itself in the contract supply sector. It must in any case be emphasised that the company's history where the development of this sector is concerned, is not recent: it originated in the Nineties in the United States when it proved itself in the real estate sector, linked mainly to the development of "luxury" residences, this important specialisation in the contracting field as a further and vital opportunity for growth. From that moment onwards, the exclusive "Friulane" kitchens started to "populate" apartments the world over: from 1992 to date, more than 7,000 kitchens have been installed throughout North America in real estate complexes of great prestige, such as the Trump Tower in Chicago in 2006. In the subsequent years, these achievements in the United States were followed by projects secured in Europe, China, Hong Kong, Singapore, Japan, Malaysia, Thailand Turkey, Dubai and Korea: precisely during these weeks, Snaidero is completing delivery of a supply of kitchens for an overall value of 6 million Euro destined for the most important real estate development in progress in Seoul. "Turkey is proving to be a still dynamic real estate market, ready to invest in quality products and trademarks", states the Snaidero Group's President, Eng. Edi Snaidero, "after the important supply to Chicago's Trump Tower, we are proud to once again link our name to such prestigious real estate developments. With this contract, Snaidero confirms its calling as a Company that exports Made in Italy designs the world over, thanks to its kitchens of the highest quality". Adaptability of the product to each individual project's requirements, a dedicated service to fulfil orders effectively, adherence to delivery times and swift post-sales assistance: these are the critical facets that prospective purchasers look for when selecting a supplier, and these are precisely the objectives that Snaidero sets itself on a daily basis in approaching the world of contracting. President Snaidero concludes: "Our business increasingly looks towards foreign markets and the contracting sector: we are a company that looks ahead, always in the quest for new solutions to be able to effectively manage socio-cultural changes and lifestyles. We believe that creativity, innovation and the privilege of having an important heritage behind us, as well as a strong corporate culture and solid values, are the necessary ingredients for being competitive nowadays. Our optimism for the future derives from the certainty that Snaidero is in fact all this". 01/11/2009 Snaidero presents Orange and Time kitchens at the Moscow fair. Read this article about the presentation of the Snaidero Orange and Snaidero Time at the fair in Moscow. On the dutch television we are broadcasting now a commercial on the occasion of the opening of our Snaidero concept Store. If you click on the image on the right you can watch the commercial. It is about the promotions of Sistema Zeta and Linea (10% extra discount) and the Neff induction hob for the price of a normal gas hob.. The last weeks we were very busy with renovating our showroom. The latest Snaidero kitchens like ORANGE and KUBE are presented now in the right way. Because of our efforts Snaidero has promoted our showroom as the one and only Snaidero Concept Store of the Netherlands. Of course we are very proud of the opening of our Snaidero Concept Store. Together with our suppliers we have agreed some promotions to celebrate the opening. These promotions (like 10% extra discount on Sistema Zeta and Linea or Neff induction hob for price of a normal gas hob) run until the end of this year. Warmth and colour, professionalism and personality, freedom of use and of composition: these are the ingredients for a young and fresh kitchen such as ORANGE, the latest model by Snaidero. A kitchen that has chosen KEN SCOTT's imagination and creativity to give its range of open accessories a touch of colour and unique style. The KEN SCOTT brand has a strong legacy with the most extraordinary and mythical fashion seasons of all time as he is the author of substantial changes in ladieswear of the Sixties and Seventies. It is a style more than a fashion trend which broke the demarcation between habitat and clothing by pointing at the chance to transform the grey monotony of the daily life in an overwhelming exotic garden. Today, the name of KEN SCOTT is associated to SNAIDERO, in exclusive for the kitchen sector, as he signed the line of cushions for ORANGE benches, stools and chairs with a selection of original and sophisticated fabrics, in which the usual original interpretation of colours and nature lives on in the kitchen creating modern and lively spaces. ORANGE taste is a refined one to be discovered in its aesthetic and construction details, where design and content have been studied down to the smallest detail. An important and essential project with a contemporary, fresh and extremely clean design; a design which conceals an extraordinary wealth of functional and aesthetic details that are the result of a development focused on enhancing the product especially in terms of its functionality and design. The KEN SCOTT cushions are a touch of class that confirm the ability of SNAIDERO to provide new interior design solutions: solid, according to its own tradition of quality and reliability and, at the same time, fresh, young and free from superfluous elements and with a touch of original sophistication. A truly refined industrial design proposal qualified by a philosophy where design is truly at the service of domestic spaces, quality and function. 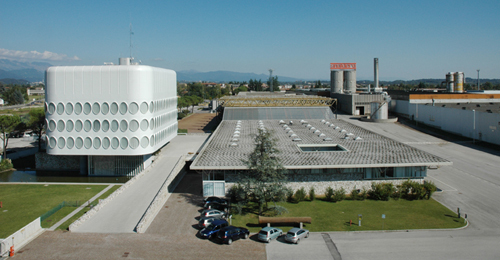 The result of an innovative system of international co-design involving all the Italian, French and German companies of the Snaidero Group (like Rational, Arthur Bonnet and Snaidero itself) and the various components of the company, the new Orange kitchen system is the synthesis of a profound renewal process. Snaidero not only works on innovation of products, but also on complete rethinking of all the corporate processes, from industrialization to management of orders, communication and simplification of assembly. With Orange Snaidero attempts to revolutionize its way of communicating, moving toward contents, media and languages closer to those of the end user. Snaidero approaches the opportunities of the current market to trigger radical change in terms of design, industrial operation, service and communication. Click on the PDF below for more pictures of the Orange. 23/01/2009 Good Design Award for Snaidero Kube! The long-standing "Good Design Award", established in Chicago in 1950, is today the most famous and prestigious international award for the design sector. It is awarded to designers and manufacturers who produce innovative and original ideas and who go beyond traditional product and design standards. From the hundreds of applications that arrive from all over the world, the panel of judges, comprising architects and experts in the international design sector, confirmed the success of Kube by Snaidero because, in a single product, it combines innovation, top-quality design, simplicity, functionality and strikingly contrasting shapes and materials. Kube is the seventh Snaidero kitchen model to have received this prestigious award since 1996, following in the wake of Ola, Idea and Acropolis by Pininfarina, Time and Skyline by Lucci & Orlandini, and Venus by Pininfarina. When we also consider the award obtained in 2005 by architect Giorgio Borruso for the Snaidero showroom in downtown Los Angeles, Snaidero has achieved this award 8 times in a row. The Good Design Award 2008 further confirms the companys strategy based on continuous investment in research, innovation and top-design to create unique products. In fact, each kitchen is the outcome of in-depth research, which includes socio-cultural trends, product ergonomics and functionality, as well as specific research into new applications for human wellbeing in the kitchen. Customer satisfaction and environmental protection are major factors governing all company choices, just like the pursuit of quality, which is guaranteed since Snaidero produces all its kitchens in-company. brand in the kitchen sector of the US market, thanks to its turnover and highly innovative design products. Happy new year from Europkitchen.com! For a Japanese client we have renovated his apartment. From this project we`ve made a webpage. You can watch this page here. are totally replacing the ones so far used by Salice. flexibility as to the use based on the width/height of the fronts. cabinet’s hinges only, while the remaining hinges show the standard metal plate. Download the .pdf file with the new typical layout of Forma, Kube, Skyline, Sintesi, Sistema Zeta and Florence. 13/08/2008 Paolo Pininfarina new chairman of Pininfarina SpA. Paolo Pininfarina (the designer of famous Snaidero kitchens) is the new chairman of Pininfarina SpA, the family Italian car design firm that counts Ferraris and Alfa Romeos among its creations. Pininfarina, who was deputy chairman, replaces Andrea who died in a road accident last week, the company said in a statement. Andrea Pininfarina, 51, died last Thursday near the northern city of Turin. Pininfarina, who was on a scooter, collided with a car whose driver failed to stop at an intersection, police said. 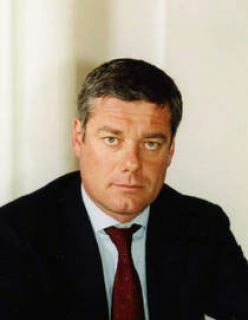 He took over as CEO in 2001, and five years later also became chairman of the board of directors, a position previously held by his father, Sergio Pininfarina, who is a senator for life in the Italian parliament. Paolo is grandson of founder Batista "Pinin" Farina. Our showroom is scheduled to close for its annual Summer Holiday starting at July the 22nd through August the 11th. Also our fitters are not working in this period. 10/06/2008 Video material of modells "kube" and "Venus"
Project "de Dokke" in Arnemuiden has started today. For this project the developer has chosen us to deliver the Snaidero kitchens in program Sistema Zeta Basic. Special for buyers in this project we have interior designer Peter Klemann from Habitouch in our showroom on the 14th of june to make their first sketches. At the same time we have cookery demonstrations with Míele and Neff appliances in our showroom. Also on the 14th ofJjune we are present at the Midzomer Event at Zeeland Airport with a presentation for project "de Dokke" in collaboration with Novaform real estate developers. On this presentation we have a maquette complete with drawings for prospects and buyers as well. Further they can also see the Snaidero presentation (for example the new program Tecnica). This project runs very well, at this moment there are just 2 apartments available anymore. As part of the Salone Internazionale del Mobile in Milan the Eurocucina is the place to be for presenting new concepts. With 270.000 visitors in 1 week this is a very important fair. Of course also Snaidero did participate and presented 3 new kitchen concepts of which Kube is the most interesting for us. This kitchen is designed by Giovanni Offredi. The first kitchens are produced now for the showrooms worldwide. Because of the possibilities with Blum Servodrive this is a very nice and clean kitchen. Also the new colour (Elm) is very nice. The Starlight is a concept designed by Lucci & Orlandini. These designers are not unfamiliar with Snaidero because they also have designed the best selling model Time and in the past Sistema ES. The Starlight is not in production yet, the presented kitchen was a prototype. The Key West is also a prototype and designed by Massimo Iosa Ghini. He has also designed the Gioconda, in production from 2000. 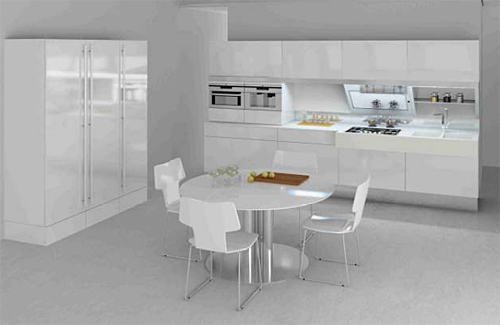 The doors of this kitchen `ll be made in the production plant of Snaidero in Croatia. In this pdf you can also read the article in the Dutch magazine Woonnieuws about the Eurocucina. Because we fly as a private pilot we have flown ourselves to Milan with a Cessna. One of the passengers has made some video`s of it. If you click on the picture on the left you can see more pictures and the two video`s on bottom of the page. In a difficult economic climate with stable consumption and increasing market competition, the Snaidero Group ends 2007 having increased its sales by 6.7% on the previous year, and with a consolidated turnover that has reached around 265 million Euros. Today, with 6 production units, 8 brands in portfolio, 12 sales branches and 2,000 sales outlets worldwide, the Group is the most globalized Italian kitchen manufacturer and certainly the one that has made larger investments in distribution, which is increasingly becoming the key link between manufacturers and end-consumers. The franchise area, comprising 3 chains of stores, two French and one Belgian, indicated great performance in 2007, increasing its control of a network of more than 260 franchised dealers, producing a turnover of more than 350 million Euros. As one of the eight brands in the Group's portfolio, the Snaidero brand increased its total turnover by 5.8% on the previous year, reaching 130.5 million Euros. This significant result is the outcome of a brand strategy that has made product design and innovation, on the one hand, and globalization, on the other, the ingredients for a unique position, focusing on the values of a stable, innovative, reliable and immediately recognizable brand. All these factors were also appreciated in 2007, particularly abroad, where Snaidero expanded by more than 16%, with over 40 years' experience in exports and its presence in 60 countries worldwide, and sales outlets that attract customers who love luxury and prestigious "Made in Italy" design. In 2008, our goal is to reinforce this expansion strategy: Eurocucina, programmed in April at Salone del Mobile di Milano (Milan Furniture Fair), will be a fundamentally important event, where Snaidero will present the results of its recent research and collaboration with some famous top-names in Italian design. This year involves three top-names: Giovanni Offredi, Iosa Ghini and Lucci & Orlandini. Moreover, investments in advertising are increasing - the sector-related and specialized press will be well represented - in order to convey both the brand and products in the best possible way. Furthermore, our distribution strategy will be further consolidated in Italy and abroad, where stores will be restyled with the Snaidero Concept Store image. Once again a pioneer, Snaidero started its restyling project more than 3 years ago, introducing a highly appealing and sensational display area, which is also entirely innovative and original, with a registered patent to protect special aesthetic features and design. Today, there are 250 Snaidero concept stores worldwide, and our goal in 2008 is to increase this to 350. For Snaidero, the forthcoming Eurocucina 2008 exhibition will be an opportunity to present prestigious Italian and international visitors with the outcome of recent research and collaboration with some of the top names in Italian design. This year's three designers: Giovanni Offredi, Iosa Ghini and Lucci & Orlandini . The late Giovanni Offredi: his style shows his sharp aesthetic-technical analysis of products. His balanced design is determined by a careful and effective proportional relationship , with versatile solidity that combines creativity that is free from conventionality. These leading concepts led the designer to create KUBE , which will be available for the retail market at Eurocucina 2008. The Kube kitchen expresses subtle formal design and refined style , with simple lines and great practicality and functionality , based on the interplay of volumes and space, and a sophisticated balance of functional units , offering different functions. Kube optimizes all available space , with its structural organization and highly systematic visual effect. Work areas are simple and free from anything superfluous, while harmoniously combining different functions (washing, cooking, food preparation and storage). This kitchen with essential design provides simple but up-to-date and dynamic shapes. For Kube, visibility is the outcome of a blend of harmonious and functional shapes, materials, colours and distinct contrasts, which convey sturdiness and versatility, expressing a clearly modern, warm and sensational style. Snaidero began collaborating with Massimo Iosa Ghini in 2000, appreciating his special style and graphic detail, with projects often inspired by tradition but that are unquestionably contemporary with their great versatility. 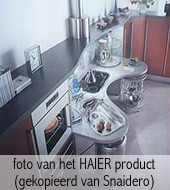 These concepts are clearly found in the new kitchen designed for Snaidero. Inspired by classic European rationalism , it re-introduces a highly contemporary look, with a warmer and more deluxe style. This design follows the current trend in versatile furnishing solutions: pursuing a distinct style and refined details, as well as a taste for quality. Wood is the true protagonist: natural and sensory with its material quality, in line with a great contemporary trend, particularly in the top sector of the market. It provides finishes in true cabinet-making tradition and unique decorative details, which retain the warm appeal and quality of classic furniture while combining a highly contemporary feel, thanks to a careful balance of classic icons and modern style. Just like a design within a design, Iosa Ghini offers a kitchen with a highly dynamic and versatile personality. It fits into any type of space, hosts on social occasions and gives the kitchen, once exclusively used as a work area, a truly entertaining role. Finally, there is the new kitchen by architects Lucci & Orlandini , a new and different expression of "home living". It is clearly a new design, where operational functionality truly becomes instantly visible tangible quality. This follows a design philosophy where design must not dominate entirely with its shapes, but rather enhance functionality, offering well-planned spaces geared to different uses, and immediately made attractive and informal. In fact, this kitchen provides great centrality for work areas , offering highly functional and specialized surfaces, enhanced with simple but refined shapes that are both functional and ergonomic. Besides specialized work areas, the kitchen extends with its simple linear lines and pure shapes , embellished by fine details in top-quality materials, which encourage you to touch them. Refinement, operational simplicity and ergonomics are the key concepts for smooth functionality in this kitchen, which perfectly offers a combination of top-design and functional elements. Today, with its industrial set-up that includes six production units located in Italy, France, Germany and Croatia, covering a total production area of more than 200,000 m2, the Snaidero Group certainly counts among leading European producers in the kitchen sector. Having to serve an unmistakeably varied sales distribution network focused on Retail, Franchising and B2B, the Group's industrial management has decided to concentrate special strategic processing at some of its production sites. 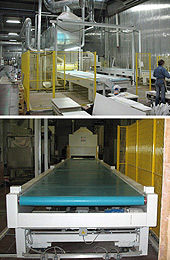 This has created an industrial set-up that is efficient and integrated in terms of production, logistics and organization, and run as highly specialized "centres of excellence" (an industrial pole for door production and varnishing, one for JIT production of special elements and accessories, and another producing semi-finished products in wood), serving all the companies in the Group. But where does the Snaidero Group's industrial set-up fit in, today, with regard to the great environmental debate? For some time now, the Snaidero Group's industrial management has been committed to adapting its production and service activities to adapt to the current environmental legislation by developing and managing a program that can gradually reduce the environmental impact. This had led to a commitment to obtain certification for its production sites in compliance with ISO 14001 international environmental regulations, which stipulate that not only must the organizational and production systems of companies comply with the strict provisions issued by ISO (International Standardization Organization), but they must also govern the ability of companies to deal with exceptional events and emergencies that may cause harmful consequences for the environment. Moreover, in adopting this management system, our company backs ongoing improvement as its absolute principle, even concerning its environmental efficiency, so that the need for ongoing economic growth and preserving natural resources for the future can be met at the same time. The production site in Majano, Italy, was one of the first companies in this sector to achieve ISO 14001 certification back in 2003, and, for many years, it has been working towards protecting the environment and its resources. The company has been using a recyclable-waste collection system since 1996, which has enabled a 90% reduction in the quantity of waste. Furthermore, for some time now, Snaidero has been recycling a range of materials such as iron, steel, aluminium-copper, polyethylene, polystyrene, paper, cardboard and wood. Water consumption for production purposes has dropped from 1999 to the present day by more than 50%. Not only has its liquid waste been considerably reduced, but also improved in quality, optimizing its heating system. Finally, its fuel consumption decreased from 751,264 kg/year in 1999 to 94,300 in 2006, a reduction of more than 80%. Special focus is given to waste materials from processing, which are collected and sent, when possible, for recycling. Significant goals have been achieved in this area as well, clearly shown by our production of non-recyclable solid waste that has dropped from 1.317,930 kg/year in 1995 to 149,400 in 2006. Nevertheless, our Group has been particularly focusing its attention over the last few years on the issue of atmospheric emissions: during the production process, the furniture units, treated with solvent-based varnishes, release toxic substances that can be dangerous for the environment. In 2006, at the Italian production unit and at the German one in Waldmuenchen, the Snaidero Group began to gradually replace part of its existing varnishing line that used solvent-based varnishes with a highly productive varnish, which greatly reduces the presence of organic solvents. Consequently, with this groundbreaking system that not only guarantees quality and protects the environment, but also adopts a Just-In-Time production system, that is, producing even a single item at the time it is ordered. The matt lacquer production process in all the Group's companies uses water-based varnishes with extremely low environmental impact, maintaining functional and aesthetic characteristics and performance indispensable in the kitchen. By March, two new lines of water-based colouring will be in operation at two of the Group's six production sites. The path taken by the Group's production units to adapt production to environmental implications has begun but certainly not ended. It is, however, absolutely foreseeable that the issue of the ethical and environmental approach adopted by companies will be at the centre of international political and economic debate for years to come. 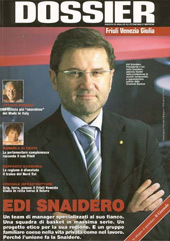 It is clear that the Snaidero Group has, for some time, acknowledged an important conviction: that environmental responsibility as a point of reference for focusing its strategy is neither intended to replace nor question the fundamental goal of the company to make a profit and provide jobs, while guaranteeing conditions for long-lasting development: increased environmental protection, improved quality of life and health protection. You inherited your enthusiasm and determination from your father, as well as the ability to continuously look ahead and foresee changes, but also your passion for sport and family values. Mr. Edi Snaidero, President and Managing Director of the Snaidero Group and patron of the Udine basketball team, has many projects in sight for his company, and for the future of the Friuli Venezia Giulia region. This shy and reserved man lights up when his team comes into action. It makes no difference whether the team concerned is his team of managers or the Snaidero Basket boys. His passion is always there. This same passion animated his father "Knight" Rino, who founded the company in 1946. At that time, Snaidero was a small artisan workshop. Today, the Group boasts 8 sales branches and more than 1,500 employees. It has come a long way. But the starting point was Udine, and his father's teachings were a point of reference, making him a leader in his family and a successful man with great business qualities. "To be a company leader, it is essential to have the ability to pursue your corporate vision with determination " confirms Mr. Edi Snaidero, the current President and Managing Director of the Group that bears his name. President Snaidero, is determination enough on its own to shape a leader? "I believe that a true leader must have the ability to create a staff team around him, who share his corporate vision, as well as the ability to make it his own and make it work with enthusiasm and tenacity. A similarity of purposes, like a large family". How important are family relations in your company? "The Group I manage belongs to the family but management is entirely modern and managerial. "Family" DNA is fundamental to the company for its culture and values with regard to roots, a sense of belonging, and the ambition to expand a company that we run and own. The managerial model that drives all this is up-to-date and finely honed, strengthened by a team of managers with international experience and culture. This is an essential condition for running a company like ours, which has a strong international influence, is active on various business fronts, and characterized by a remarkably complex set-up and organization". What are the advantages of living in a province for a company of international repute? "The fact that we were born and bred in Friuli has enabled us to benefit from its work culture, which permeates honesty, seriousness, and a spirit of sacrifice and belonging that are proverbial in this area. Until a few decades ago, "being in the province" imposed limits due to the distance from focal points in terms of business opportunities, and to the difficulty in finding top contacts. Nowadays, advanced modern technology and communication systems have removed these limits and the "physical distance" has now become an irrelevant variable to business. As regards the ability to find qualified resources, now, it is possible also in the provinces to form a top-quality management team. As far as I am concerned, I select my team, above all, from those who are committed to a life in Friuli Venezia Giulia. This is a key requirement; then professional opportunity is a means of valorization, but I believe there must always be an underlying desire to put down roots here ". Which are your markets and what is the impact of each one? "The Group's main market is Italy - 33.8% of total turnover - thanks to the Snaidero brand, the protagonist of extraordinary growth in the last five years. The French market is second, which totals 24.4%, followed by the German market - more than 13% - which is a kind of "record" since Germany is our largest rival kitchen manufacturer ". What is your attitude towards emerging markets? "Internationalization is a "must" for us. A great challenge in the near future will be the Chinese market, which is developing at an extraordinary pace. We consider China a great opportunity that is destined to last a long time". "Success is something transitory. Here today, but tomorrow is uncertain. Maybe it is this awareness, together with a sense of self-criticism that produces the conditions for the right amount of uncertainty that leads you to continuously search for new solutions, creating a certain attitude of mind and a business approach driven by research and ongoing evaluation. True success is that tireless ability to guarantee it continues over the years, interpreting mistakes and failure. I am convinced that the driving force behind every company that focuses on excellence is innovation, but interpreted in a wide sense, as the ability of all our companies to not only offer a product or a service but also provide a business connection that is able to look ahead and foresee changes". "This spirit always characterized the decisions and actions of my father Rino Snaidero during his life, everyone considered him a "Knight", a person who was truly able to create through innovation: from an idea he created a brand, a synergic team, and, above all, a group of people that has always focused on conveying its extraordinary insight for innovation and tireless ability to look ahead. It was in order to keep this spirit alive, while contributing to developing social, cultural and scientific awareness and progress, that I decided, together with my family, to set up a Foundation entitled the Snaidero Foundation, in remembrance of my father". "It represents a "factory of ideas", which, via an international network of partners, aims to improve the quality of life in the home. It is, above all, a multidisciplinary organization: people, instead of technology, are at the centre of this project, becoming the driving force of innovation. It is often hard for technology to enter the market, families and homes, as it does not consider consumer requirements, and is all too often self-referential. Using this approach, the Foundation undertakes research relying on an organizational model that is innovative in itself: we wanted to call it Creal-Lab as it is based on two teams. One team is creative with multidisciplinary competences creating ideas and innovative projects, while the other is productive, taking this free creativity and translating it into projects that are feasible in terms of the technical, financial and scientific aspects. The Foundation promotes and will continue to promote culture as well, contributing to social, cultural and scientific progress by spreading knowledge and organizing training sessions". How do you combine your passion for sport with your business vocation? "Both are part of a communication project for a strong, dynamic and modern brand, with a distinct inclination for challenges and success. Naturally, this passion involves considerable energy in terms of time, resources and organization. I like to assess the results, not only in terms of brand and company visibility but also in terms of the extra energy required to promote corporate and local culture, where basketball has now become synonymous with enthusiasm, pride and, last but not least, social responsibility. Since 1999, under the "Snaidero Project", Snaidero has been sponsoring mini-basketball activities in the Friuli Venezia Giulia region, in order to give youngsters the chance to take part in healthy sporting activities, with the firm belief that this contributes to the wellbeing of the local community". Do you prefer to win a championship or achieve a leading sales position? "Obviously, corporate results are a priority for me, as well as a job driven by passion, but also experience and deep-rooted values. Moreover, in sport serious strategies and organization alone are not an adequate condition for success: luck and unpredictability are the important variables in this field. Instead, for a company these are easier to control ". by Giusi Brega, from Dossier Friuli Venezia Giulia. On Monday 26th and Tuesday 27th of march, Rudy Jacobse was a guest at the Snaidero Headquarters (and factory) in Italy. The reason for this invitation, was to take a close look at some new kitchen modells. As you have grown accustomed to our website and services, we will keep you updated on introductions of new kitchens modells. The first convention of the Rino Snaidero Scientific Foundation, held on Wednsday 22th, November at the Snaidero Group's headquarters in Majano, was a great success. The Foundation dedicated to Cavaliere Rino Snaidero was established for the purpose of honouring his memory and for maintaining and preserving his innovative spirit; the Foundation's mission, in fact, it is to "generate ideas and positive values in the social, entrepreneurial, cultural and scientific fields with a view to improving the quality of life in the home". The Convention was opened by Ing. Edi Snaidero, the group president, who, after expressing his delight at the enthusiasm with which the project was welcomed at all levels, highlighted the centrality and importance of people in all the future activities of the Foundation. After focussing on the importance and authoritativeness of the members of the Technical and Scientific Committee, Marco Vitale, the president of the Foundation, illustrated the unique qualities of the Rino Snaidero Scientific Foundation as a tool for promoting the spirit of innovation in medium-size Italian quality companies, aiming especially at young people who in recent years have had to stay on the defensive given the growing complexity of the international situation. Professor Alberto Sangiovanni Vincentelli who lives and teaches in Berkeley, California, explained that he had joined the committee due to the central role given to disabled people in the Foundation's projects: improving the quality of life in the home means thinking about the life of all members of society, placing people at the centre of innovation. The final speech of the convention was made by professor Adriano De Maio who underlined how it is important to "listen, look and work together" in order to anticipate future scenarios and thus generate progress. In that sense, the Foundation is a perfect tool for "working on useful things in view of happy things". "Grande Fratello" (Italian translation for Big Brother), the most famous reality show on Italian television, is starting out on its sixth edition. This year, the totally renovated house has been divided into two separate units: one is a poor, austere and badly furnished house while the other is a real and proper palace with a magnificent, elegant and comfortable look to it. The first part, the one that the competitors saw first, was austerely designed and furnished, well suited to the privations and "media imprisonment" the tenants are subjected to: old and worn furniture, creased blankets and discomfort. The second part, instead, is a fabulous house where yet another Snaidero kitchen has been installed for this edition: the SKYLINE model. This famous kitchen, designed by the architects Lucci and Orlandini, was especially built to adapt to the finishes, colour scheme and structure of the surroundings and the quality of the furnishings, floors and fabrics. The lacquered Shiny Feather Grey finish was chosen, together with a top in Carrara marble to add as much luminosity to the kitchen as possible. Special features of this composition are the gold-coloured shelves which were especially made for the programme. They are in keeping with the luxury of the rest of the house and are further proof of the astonishing production flexibility of the company which can create personalised solutions for each of its customers. The design of Skyline is based on the principle of eliminating the superfluous and adding value to functions by giving preference to cupboard instead of wall units. In the "Grande Fratello" house, in fact, it also offers a great deal of cupboard space, with electrical appliances fitted to the wall, and a large and capacious larder area. Visibility, together with extreme liveability, is assured thanks to the large island structure featuring a semicircular shaped worktop which ideally encloses the occupants of the house in order to make them the protagonists of the kitchen area under the surveillance of 70 cameras and 80 microphones covering every square centimetre of the house. This uniquely structured kitchen immediately brings Snaidero to mind: total recognition is assured thanks to its unique design and outstanding functionality. The entire product has generated additional success and satisfaction for Snaidero with one of its models being installed in the most famous house on TV for the third year running. Click on the image next to this news item in order to enlarge the image. Besides the "Ola" kitchen, Pininfarina also designed the wellknown "Idea" model, this model has no handle bars and is a bestselling model within Europe. In the international world of design, the "Acropolis" kitchen is the subject of discussion. Every shape of the kitchen is rounded, every element of this kitchen is focussed on the user. The design is both futuristic and timeless at the same time. The first Acropolis concept was presented in 2002. In order to present the potential buyers of this kitchen a better and dynamic view on Acropolis, we present you an online brochure of the model. People who want a "live" look at the kitchen, can make an appointment with Europkitchen, in order to visit Snaidero (in Italy) with us. The model can be delivered without delays. Only Snaidero does the fitting of the kitchen, the measurements and set-up of the kitchen are too specific for a regular trained mechanic. The estimated price for the kitchen will be € 97.500,- (including customized fitting of the kitchen, applications and taxes). Following Ferrero, Snaidero has also won the war on forgeries by its Chinese competitors. As our rights had been infringed by a Chinese kitchen manufacturer (Haier) who had copied not only the models (Skyline) but also the photographs, we managed to convince the Chinese authorities, thanks to the intervention of our ambassador, to interrupt production of the Chinese company. Ing. Edi Snaidero pointed out how this case could become an important precedent for defending companies which, like Snaidero, represent Italian style, invest in creativity, innovation and design, and market the results on all the international markets. The Snaidero Group, which has approximately twenty Snaidero and Rational outlets in China, is obtaining excellent results with the two brands, so much so that it is currently the largest exporter to China in the world. The clear response by the Chinese authorities is a good omen for all companies that invest in brand, research and innovation. We think it is right for there to be rules that allow companies to compete at the same conditions as this promotes research, continual innovation and improvements in product quality. From April 5th to 10th, the yearly exposition "Eurocucina" took place in Italy. It is the leading exposition where kitchen manufacturers and import companies showed their new collection and innovations. Snaidero presented a new kitchen modell, which was designed by Giovanni Offredi. 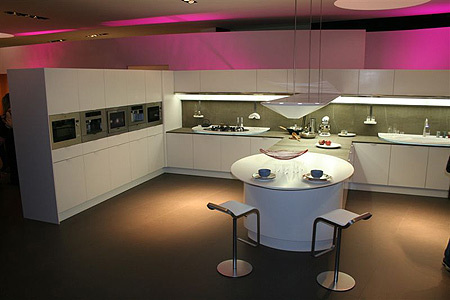 This kitchen will be available to the customers in the last months of 2006, but the visitors of Eurocucina were able to take a first look at the modern design. Snaidero shows us that the usage of natural materials (like wood) are the trend for 2006 and 2007. Snaidero has been able, throughout the 60 years of their history, to clearly distinguish themselves among all the other kitchen manufacturers, for their ability of keeping continuously on the move, anticipating the needs and desires of the customers and delivering solutions which better respond to those requests, through the collaboration with the most celebrated Italian designers such as Pininfarina, Gae Aulenti, Iosa Ghini, Lucci & Orlandini among others. Snaidero's participation to Eurocucina resulted in a very good presentation of three new kitchen modells, which you can view on the left side of this news message. You can enlarge the photos by clicking on them. The Snaidero modells promise a lot of "cooking pleasure" for this year, the total collection is strengthened wit marvelous, practical and modern designs. Snaidero participated in the 2005 edition of Big 5, the largest trade fair in the Middle East dedicated to the construction and contracting industry, which was held from 16th to 20th November at the Dubai International Exhibition Center. This unique event was attended by approximately 2,000 exhibitors from 50 countries and attracted thousands of contractors, architects, engineers and decision-makers. Located in the centre of the Italian hall, the Snaidero stand features Skyline in its dark oak finish and the light oak version of Time. It was a very important event for the company at what is one of the most successful trade fairs in Dubai, a rendezvous for leading western and eastern exporters.